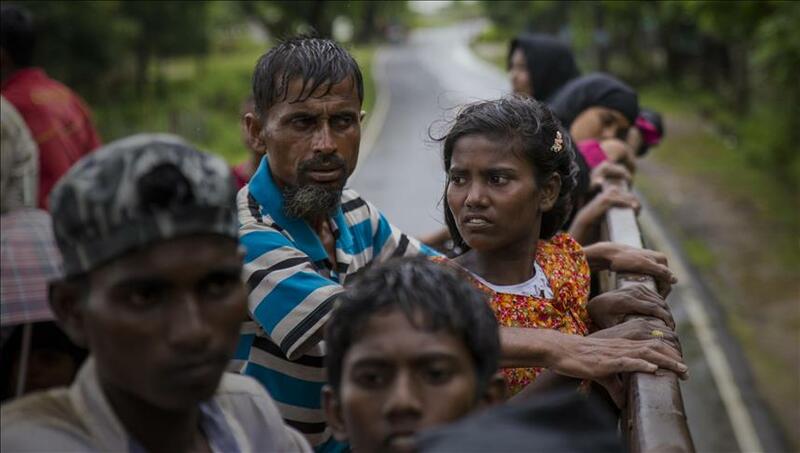 ANKARA -- Rohingya survivors of the Myanmar genocide are demanding a UN security force to guarantee their safe return to their homelands, terming the new agreement signed between Myanmar and the UN as inadequate, experts tell Anadolu Agency. On June 6, the Myanmar government signed an agreement with the UN Development Programme (UNDP) and the UN Refugee Agency (UNHCR), allowing them to get involved in the much-delayed repatriation process. Maung Zarni, coordinator for strategic affairs at the Free Rohingya Coalition, and Natalie Brinham, an economics and social research council Ph.D. scholar at the Queen Mary University of London, wrote an analysis piece for Anadolu Agency giving their views on the new agreement. "One million Rohingya survivors of Myanmar genocide, who took refuge across the borders in neighboring Bangladesh, remain largely unpersuaded by the news of the latest repatriation deal the United Nations agencies have signed with their perpetrators in Naypyidaw, and openly call for 'UN Security Forces' to guarantee safe return to their homelands in the Western Myanmar state of Rakhine," they wrote. The analysts said on June 6, two UN agencies with mandates for refugee protection and development inked a memorandum of understanding with the government of Myanmar. However, the contents of the agreement were treated as if it were Myanmar’s top national security secret, they wrote. "The conditions on the ground indicate no semblance of physical safety for any returning Rohingyas," the analysts said. Zarni and Brinham added that there is also no indication that the official acceptance of Rohingya by Myanmar as an integral ethnic minority of the union is forthcoming. "And there is little prospect for their reintegration into the predominantly Buddhist society where the most powerful Senior Gen. Min Aung Hlaing publicly declared his genocidal intent, that Rohingya presence in N. Rakhine was 'unfinished business' from the pogroms of WWII," they said. "In addition to the frightening prospects of being marched back to Myanmar’s 'killing fields', what has unnerved Rohingya refugees in Bangladesh -- thousands have been in refugee camps in Bangladesh since the early 1990’s as they fled the earlier waves of violent persecution -- about this latest UN-Myanmar refugee deal is this: UN agencies -- UNDP, UNHCR, World Food Program (WFP) -- have a dismal record when it comes to standing up for the Rohingya in the last 40 years since UNHCR first became involved in the repatriation process in the summer of 1978." Zarni and Brinham said the UN’s reputation -- and most specifically the reputation of UNHCR and UNDP -- is on the line in Myanmar, and beyond. "Any part they play in facilitating returns from Bangladesh to Myanmar is risky -- when returns could potentially result in another round of mass killings, further decades of containment in concentration camps or deliberate slow starvation," they said. The analysts urged the UN agencies to place protection and human rights first this time around. "The signs of a new secretive deal don’t bode well for the Rohingya survivors. The newly-managed UN in Myanmar has even shelved the organization’s own governing principles, namely transparency and inclusivity, as evidenced in the freshly-inked MoU with Myanmar," they said. Zarni and Brinham added Myanmar is now suspect in the eyes of the International Criminal Court and international law circles. "In apparent compliance with the demands for secrecy typically made by Myanmar’s military-controlled NLD-government, the UN has not made public the MoU for scrutiny. Neither has the UN included Rohingyas in any stage of the negotiations over the MoU, nor spelled out their future role," they said. The analysts said the UNHCR had added a fourth adjective, “sustainable”, to the mainstreamed mantra of “voluntary, safe and dignified”. "To make the fourth adjective viable, the UN must listen to Rohingya voices that call for a protected return to a protected homeland in Myanmar."